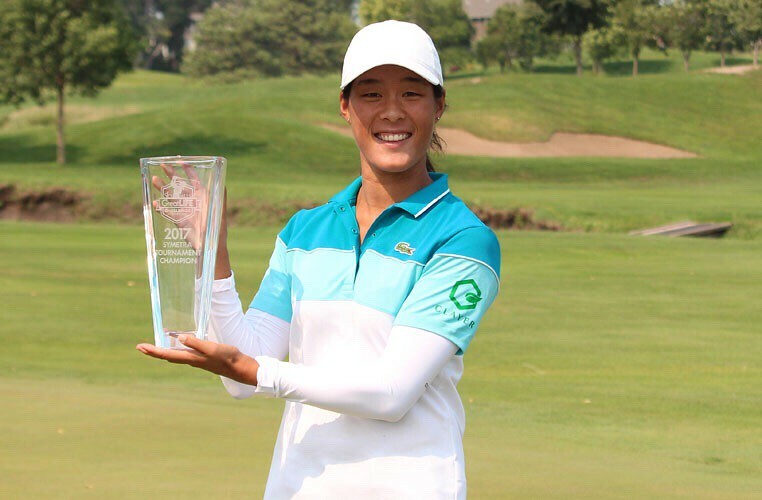 Celine Boutier (Montrouge, France) built a big lead on the back nine and held off Benyapa Niphatsophon (Bangkok, Thailand) to win the Sioux Falls GreatLIFE Challenge by one-stroke on Sunday on the Symetra Tour. She carded an even-par, 72 in progressively more difficult conditions as the day continued and finished with a four-day total of 11-under, 273 to edge Niphatsophon. Katelyn Dambaugh (North Charleston, S.C.) finished third at 8-under, 276. Boutier picked up her second win of the season and locked up a spot on the LPGA Tour for the 2018 season. Boutier’s first-place check of $31,500 moves her to $96,748 earned in 17 starts. Boutier moves to second on the Volvik Race for the Card money list and has now earned the fifth most in a single-season in Tour history. Niphatsophon earned the second place check of $19,887 to get to $102,288, the third player in Tour history to crack $100,000 in single-season earnings. Boutier has made eight starts on the LPGA and now will get to play the Tour full-time for the first time in 2018. Boutier has developed a knack for winning big events and she hopes that translates to the LPGA. Her other win came at the Self Regional Healthcare Foundation Women’s Health Classic, which carries the second largest purse of the season. After a 63 on Saturday, Boutier wasn’t as hot on the front nine on Sunday. She started the day with nine pars including a clutch 8-10 footer on hole nine. She made the turn just one-stroke in front of Katelyn Dambaugh. Boutier made a 10-footer for birdie on the par-5 10th and also made birdie on 12 to get to 13-under. At that point, her lead swelled to four shots. It remained that way until the 17th hole when Boutier made her first bogey of the day and Niphatsophon made birdie. The lead was two-strokes to the 18th hole and Boutier sprayed her tee shot right. She had an angle to the green, but was playing from the almost the first fairway. She recovered with a nice approach to the left fringe. Niphatsophon missed her approach short and left, but nearly chipped in for birdie. Boutier three-putted for bogey, which was good enough for a one-stroke win. Boutier grew up watching The Evian Championship in France and that spured her interest in playing golf professionally. There is one new member of the Volvik Race for the Card money list top 10. Lindsey Weaver (Bellefontaine, Ohio) finished T8 and moved from 11th to 10th. Dambaugh also made a big move up the money list. She jumped from 29 to 16. Kim Welch (Sacramento, Calif.) finished fourth to move from 24th to 15th.